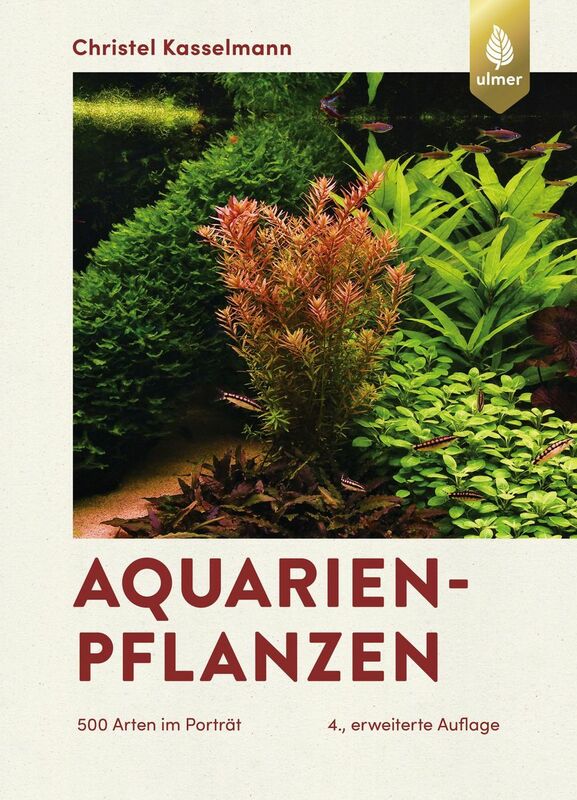 For those of us who are really serious about the hobby, there is no book that is more important in our libraries than “Aquarium Plants” by Christel Kasselmann, or the German edition, “Aquarienpflanzen”. The 4th German edition is, in comparison to the 2nd English edition of "Aquarienpflanzen" (published 2001), a completely new book with extensive revision and extension. It has 640 pages and 845 colour photos (the 2nd English edition had 504 pages and 532 pictures). The book "Aquarienpflanzen" by Christel Kasselmann (Germany) is the most comprehensive book about aquarium plants worldwide. The main part consists of plant portraits of more than 500 aquarium plants from A to Z plus information on another 250 species, varieties, growth forms and living conditions in their natural habitats. 78 habitats from the tropics are described in detail with full-water analyses and soil investigations. Christel is not only THE world authority on aquarium plants, but is also a dear friend and my travel companion on many adventures around the world. 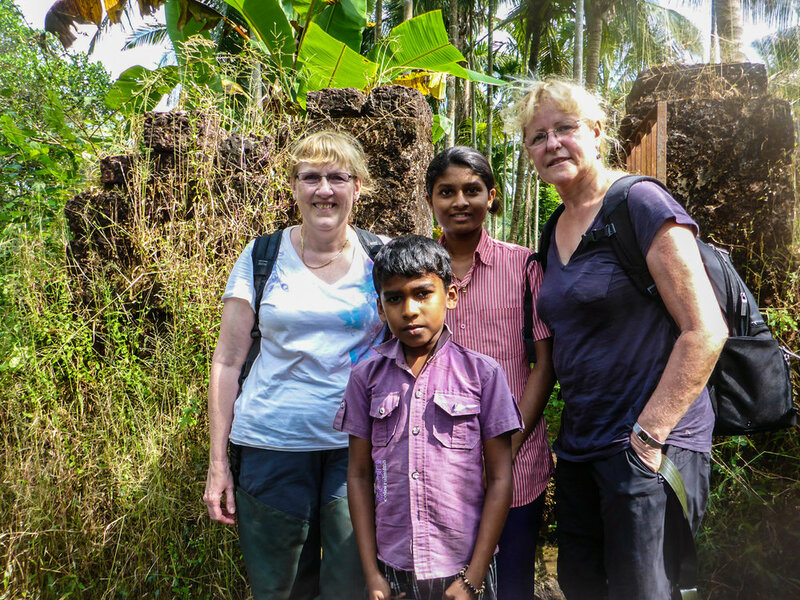 Karen and Christel visit with some local children in Kerela, India. I can’t imagine being without this book, even if it is in German. I still keep my English edition, and the older editions in German were useful too. But these days, it is really quite easy to scan a page and put it through a program like “Google Translate”, even if you can’t read German. (for your own person use only, of course!) Believe me, if you are serious about aquatic plants, there is no other book like this. You can purchase the book directly via Christel’s website. This article was originally published in The Aquatic Gardeners Association Magazine. Barclaya longifolia is an unusual member of the water lily family. It is unusual in several aspects. Unlike most water lilies, which have rounded, floating leaves and flowers, Barclaya longifolia has long narrow leaves and grows completely underwater… It even flowers under water! And it is one of a very small number of plants that can successfully germinate and produce seeds entirely under water. This species is native to southern Asia, and my experience with it in the wild has been in southern Thailand where it is relatively common in fast flowing clear, soft water streams. It is typically found in loamy substrates, though depending on the time of year, a layer of leaves can build up on top of the loam in areas where the current has slowed. The plants are occasionally found in areas that would get sun for most of the day, but it is also common in fairly deeply forested areas, where it only receives direct sun for a short period, and is shaded the majority of the day. The author, with a beautiful Barclaya longifolia from a typical loamy stream in southern Thailand. This type has a green upper leaf and is magenta pink underneath. Barclaya longifolia among tree roots in southern Thailand. As mentioned above, the plants flower entirely under water, and the flowers are self-fertile and readily set seed. When the seed pod opens, the seeds are released in a jelly-like mass, and are distributed downstream. In some cases, you can find the seedlings growing in a thick mass where the seeds have gotten snagged in among tree roots. Other times, the seeds settle out singly, in mid-stream, and as a result individual plants can be found along the water way. It is common to find Cryptocoryne cordata growing in the same streams as Barclaya longifolia, sometimes the two species even mingle together. Barclay longifolia flowering, totally submersed, near the banks of a stream in southern Thailand. A large number of Barclaya seedlings have been snagged in the roots of a tree. As the Barclaya seedlings grow into adult plants, they also grow a large bulb-like storage organ that can support the plant during difficult growing times. We occasionally found plants in very shallow water as the stream level dropped in the dry season, so it is possible that this bulb can sustain the plant through dry periods. It is also likely that the leaves are ripped off the plants in flood water periods during the rainy season, leaving the plants unable to photosynthesize in the deep, muddy flood water. This storage organ would be useful in those conditions also. This plant is almost high and dry as the water level recedes at the start of the dry season. Barclaya longifolia is a commendable aquarium plant. In the past, it has sometimes been difficult to find good bulbs. Many times, people would buy bulbs that never sprouted, leading them to think this is a difficult plant. It really isn’t if you start with healthy stock. The good news is that the plant is now in tissue culture, so it is much easier to get healthy plants. The bad news is that of course baby, tissue culture plants do not have a bulb yet. That means that they will depend entirely on the aquarist to provide them adequate nutrition, until, over time, they build a bulb. This plant does very well in moderate light, and grows best with supplemental CO2, though it is not entirely necessary. There are several color varieties. The one I like best has a satiny green upper leaf with a pale pink below. Unfortunately, this seems to have fallen out of favor, and the deep red type has become the common type in aquarium cultivation. But this is a lovely plant too, especially if you want a stunning red center piece plant. Occasionally, I have heard of Barclaya longifolia going dormant in the aquarium. They do not require a “rest period outside the tank. If this happens, simply leave them alone, and as long as they have been well fed before dormancy, the plants should sprout again when they are ready. One of the fun aspects of Barclaya longifolia is its ability and willingness to flower in the aquarium. By water lily standards, the flowers are very modest, but it is still fun to see any plant flower under water. Leave the flowers alone and seed will set. I normally just allow the seed to disburse around the aquarium. Over a period of months, you will find baby Barclaya plants growing up in unexpected places. When they get big enough, you can move them wherever you want. If you want to maximize production, you can try to capture the seed in fish net material tied gently around the stem of the flower. Once the seeds have matured, and the seed pod has ruptured, you can sow the seed in good substrate in a shallow tank, filling the tank deeper as the plantlets grow. If you are involved in the HAP program in your local club, this is a great plant to use for sexual propagation. It is one of the easiest to reproduce via seed on you hunt for your Master Gardeners Award! ZetLight (left) and AquaLighter (right) on two globe shaped terrariums. These can bring a spot of sunshine to any corner of any room in the house! I don’t normally do product reviews, because I don’t accept products from manufacturers for that purpose. But I know how hard it can be to find the right light for a very small tank, especially one with curved glass. So since I was hunting for one, I thought I’d share my findings with you. Here’s a quick little review of several nano-sized lights and how they perform. I have not included any “kit” lights that come packaged with a tank, and there are certainly other options. The ones I chose were picked specifically because they seemed to have possibilities for use on bowls and cylinders as well as flat-sided containers. First is the ZetLight, ($25.50 when available) which was popular on The Planted Vase. At the moment, this seems not to be available in the US, but may become so again, so since I had one to test, I did. For all these lights I tested them on the rim of a globe shaped bowl, at 11” (the depth from bowl bottom to light) and at 9”, the approximate depth if substrate was in the bowl. Of course there was no water, hardscape or plants in the bowl, so these numbers are somewhat different than you would get in use. The ZetLight fits easily on the rim of the bowl, tightening with a plastic screw. Even to my eye, the light looked underpowered. And, indeed, the PAR meter gave me 10 umols at 11” and 14 umols at 9”. That’s pretty dismal. It will work for Anubias, the hardiest Bucephalandra and some easy floaters, not much more in this size bowl. My recommendation would to only use this light on the smallest bowls/vases. I also don’t care for the blue diodes in such a small light. They don’t really help the plants and they are a nuisance to the eye. This one was a bargain for the price, but a failure in my book for a round tank. It’s just not meant to do that job. As hard as I tried to squash it into submission, it is just not meant to light a bowl. In spite of that, it is remarkably bright for such an inexpensive light! This was the best I could do positioning it on the bowl, and aesthetically, I think it looks terrible. OTOH, the PAR measurements were 27 umols at 11” and 35 at 9”, so significantly better than the ZetLight for a lot less money. Oh, the other thing I disliked was that they had two clumps of blue diodes that made two annoying blue squares. In fairness to the light, since the PAR was pretty impressive for the price, I also threw it on a rectangular tank (which it is clearly designed for) and measured it there too. 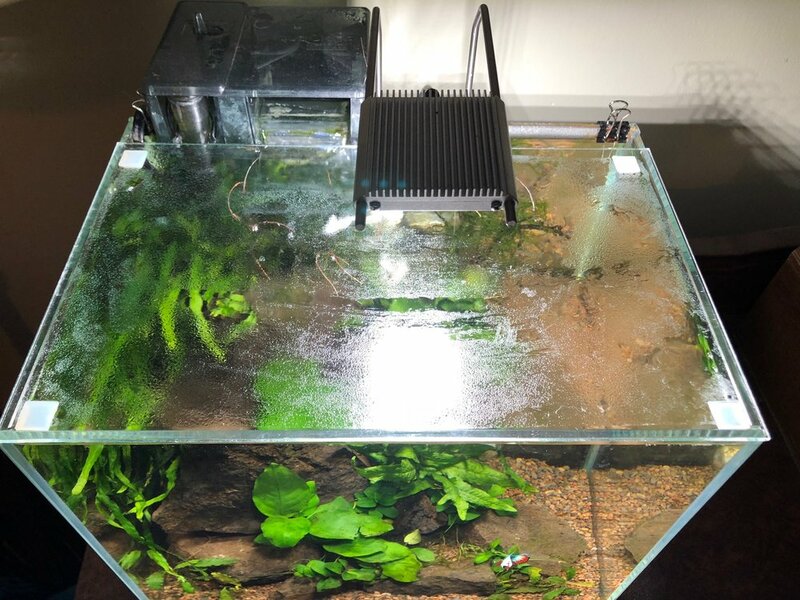 Not unexpectedly, it did better, with 33 umols at 11” and 45 umols at 9”… Enough light to have some fun with a number of different plants, without running into algae problems without supplemental CO2. And it looks very nice on an appropriately shaped tank. Yes, it’s a lot more expensive, but it’s MADE to do this job and it does it oh, so elegantly. The mount is a very strong magnet in a very soft rubberized housing so it does not damage even the curviest glass. It looks beautiful! It looks like it is made for a globe! PAR is right there with the cheap but ugly Aquaneat, at 27 and 35 umols, so just what I’m looking for in a very small tank. For this test, however, I set it up on the naked bowl, just like the other lights and cranked it up to full power. AS expected, the results were impressive. 140 umols at 11” and 165 at 9”. This light also comes with a second lens so that you can have either a greater spread or a narrower beam of light at your choosing. I think the Asta 20 looks lovely on my Dad’s cylinder. I am also planning to use two of them to light my new, large, Wardian Case. But on the bowl, I not only think it looks large and clunky, but the same hefty metal attachment that I appreciate on a larger tank make me worry whether the thin glass of this bowl could take that point-pressure over time. …And you’d have to keep the darned thing turned down SO far most of the time that it would really be a waste. So use this happily of bigger tanks, and enjoy the littler ones on the vases! I am sure there are LOTS of other options out there, but I bought all these with my own money, and that’s all I’m buying for now. If anyone else has a PAR meter and wants to test other lamps for nano tanks or vases and send me the results, I’d be happy to add them to this! My Dad is almost 90, his heart is failing and he can't really get out much. But his mind is sharp as a tack, and he's still always looking for things to learn. 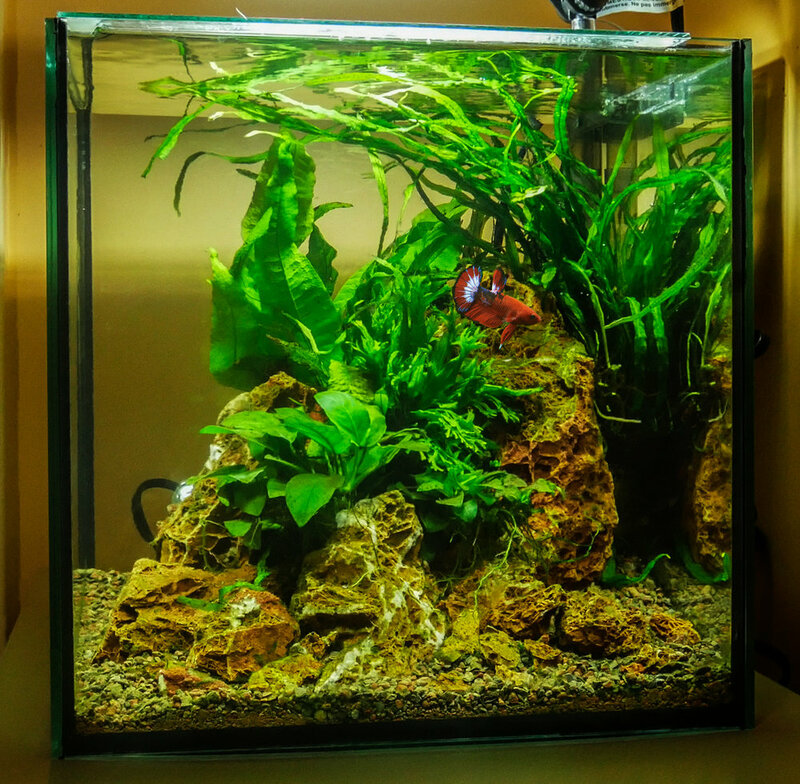 He had aquariums as a child, and has enjoyed mine over the years, but hasn't had one of his own as an adult. (my mom ran the ones we had growing up) His last tank was broken during the bombing of Berlin during WWII. This is a photo he took at that time, near the apartment in Berlin that he lived in as a teenage with his parents and siblings. When Sunken Gardens” came out, he read it, cover to cover, and called me regularly to ask me questions as he read. At the time, he toyed with the idea of setting up a little tank, then decided it might be too much for him. But the book is still sitting on his coffee table. I took him out to lunch today and asked if he might like to have a new little cylinder tank I recently put together at his house. I told him all he'd need to do is feed the Betta, and that I'd do the maintenance on the tank every week or so. He was delighted with the idea!!! Epiphyte? Rheophyte? What are those plants? The ferns and many Aroids that we use in aquariums are all seasonally rheophilic. They are called facultative rheophilics. 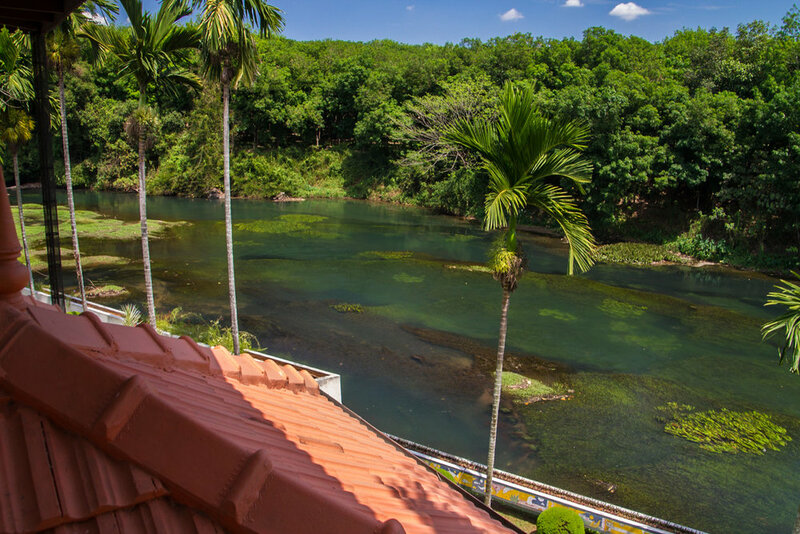 They live on the banks of either waterfalls or seasonally fast-flowing waterways. Bucephalandra (also facultative rheophilics) is a bit different than others that we use because their environment can change daily or even hourly with the very fast change of stream depth and force in the rainforest. 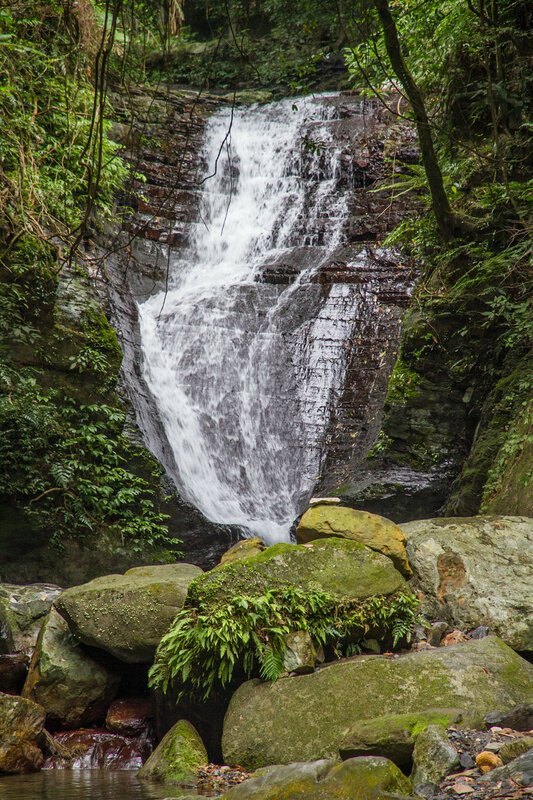 Streams and rivers with Rheophilic plants in Taiwan, Borneo and Thailand. All have much deeper, faster water, depending on the season. Mosses are even more different. In nature, most can attach either to soil or to wood or rock. (so some could be considered epiphytic) But most are not rheophilic. 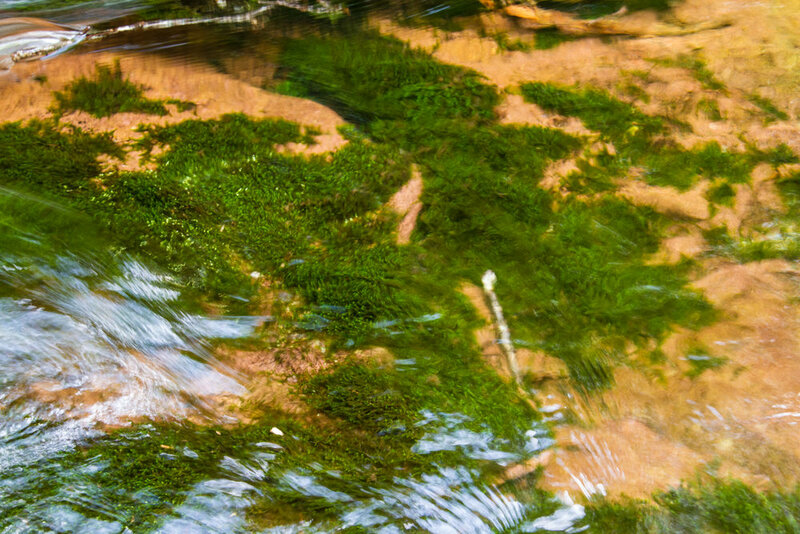 Though many grow in rocky streams with more moderate flow, most can’t withstand really fast water flow. While some do grow on river rocks, only the base, tight against the rock, would survive in fast flowing water in the rainy season. Borneo, Taiwan, Thailand. 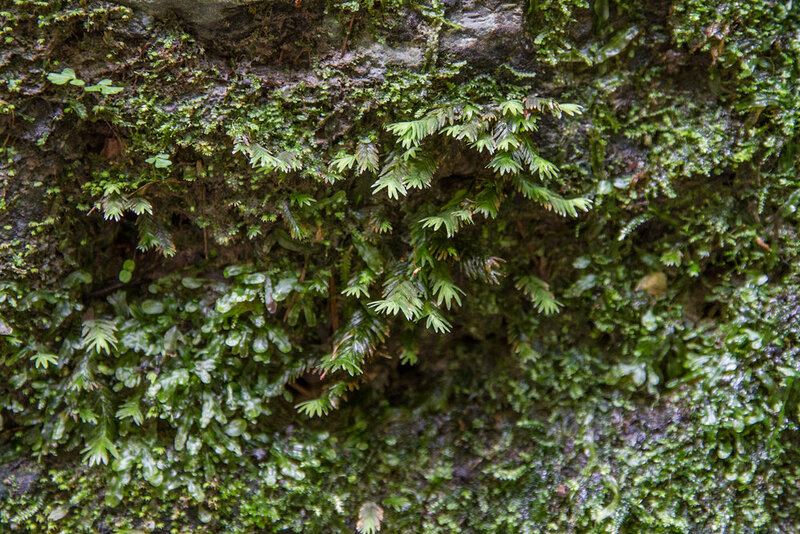 In these settings, the moss is tight against the rocks, because it can withstand both emersed/humid and submersed, fast water conditions in this state. The center (Taiwan) photo is interesting because of the different species seen. What looks like a liverwort is probably the gamete form of the ferns that are starting to emerge on the face of this rock. Many of the most beautiful mosses and “moss scapes” in nature are in temperate areas, with short summers and cool temperatures. These were taken on the Bay of Fundy in Canada. 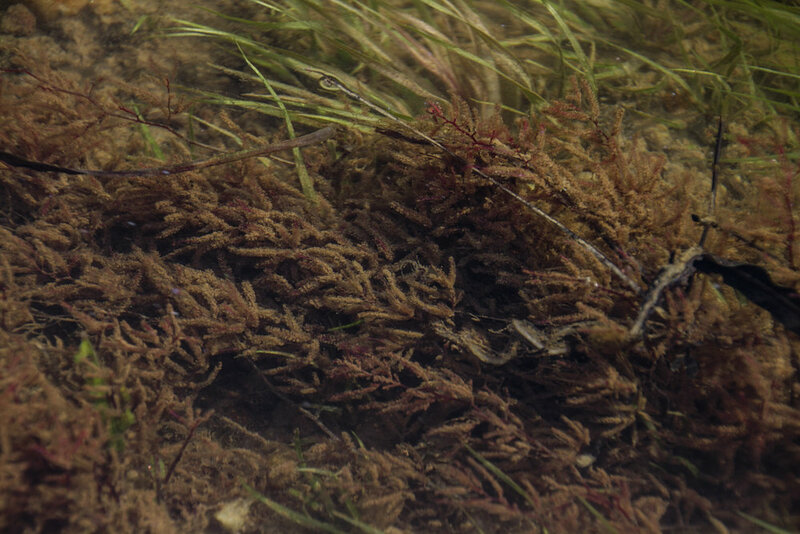 Alas, these mosses, even those found in the water, rarely survive or look good for long in the aquarium. The plants we use in the aquarium grow almost exclusively on rocks or in heavy gravel in the wild, even though they oblige us by growing happily on wood in the aquarium. While many do not tolerate even SLIGHTLY anaerobic conditions around their roots, they do feed through their roots as well as their leaves, just like all other aquarium plants. There is a range among these plants too. While Java ferns are never happy with their roots in a soil substrate, in the "old days" when people commonly used heavy river gravel as the substrate in their aquariums, Java fern tolerated being "planted" in that, especially in tanks with undergravel filters, because they moved water through the substrate. (again, largely a thing of the past) With modern substrates, Java fern really needs to be attached to something above the substrate. Anubias and Bucephalandra are different. While it is important not to bury the rhizome on these plants, they DEFINITELY can, and do feed happily via the roots, and the roots will find their way into the substrate on their own given the chance. While it is usually easier to place Anubias appropriately if you attach it to rock or wood, it is also entirely possible to "plant" Anubias in the substrate as long as you are careful ONLY to put the roots in the substrate, and not the horizontal green rhizome. 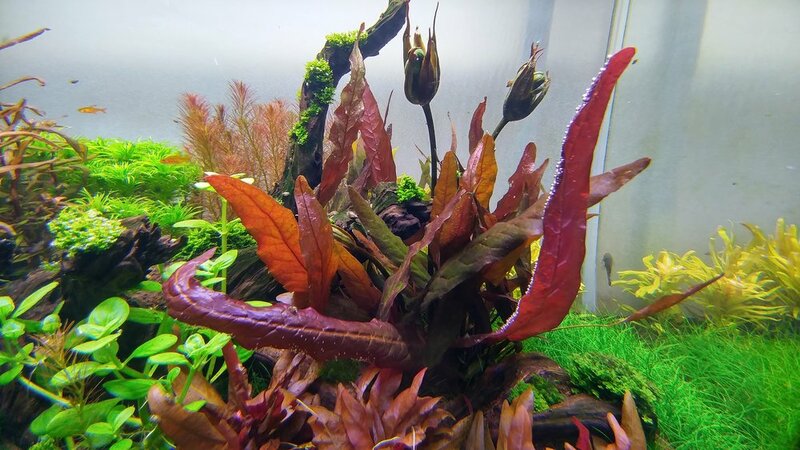 Buce is a little more complicated because the roots are relatively short on these small plants. So burying the roots without burying the rhizome can be tricky. So for most people, it makes sense to attach the plant to a small stone and place it on the substrate, then let the plant grow out where it wants. Both genera will, however, also grow completely happily attached to structure higher up in the aquarium, as long as adequate nutrient levels are kept in the tank. A (very) old tank, with large Java fern ‘planted’ in the heavy gravel substrate. There was nothing with any nutritional content in this substrate other than some mulm(which I dutifully sucked out fairly often) You can see, in this setting, the Java ferns are faring better than the plants that would do better with more nutrients in their substrate! Obligate rheophytes are almost never kept in the aquarium. I say "almost never", because every time I post that, someone posts that they are keeping, or know someone who is keeping a true rheophyte in the aquarium. Certainly, on a commercial basis, these plants are never available, and I have yet t see evidence of anyone keeping them long-term. True rheophytes inhabit EXTREMELY fast-flowing water and require that for good health. They can be found all over the world, from tropical climates to very cold climates, and are often extremely beautiful. Every time I have taken some, just to photograph in a photo tank, even a few hours later, packed carefully and kept cool, they start to deteriorate. A true rheophyte, probably of the family Podostemacea, in the Thodaphuza River in Kerala, India. These plants are not good aquarium plants, and in spite of spotty, and usually short-lived reports of their use in an aquarium, none have ever made it into the commercial line-up of aquarium plants, and it is unlikely that they will with their very specialized requirements. So the most correct term for ALL the "attach to something" plants we use in the aquarium is “facultative rheophyte”. Aquatic Gardening and Sunken Gardens in the News! Tim Gross of the Pittsburg Area Planted Aquarium Society brought a very nice article in the Pittsburg Post-Gazette to my attention today. The article is on planted aquariums, and includes an interview with Tim, and nice comments on "Sunken Gardens" and the Aquatic Gardeners Association. My current grow-out racks, one of two. I have a lot of storage now! It can be very useful to keep some of your aquatic plants in emersed set-ups. You can learn about them and enjoy their flowers, positively identify species, propagate some species more quickly and store plants that you don't have space for in your current tanks. I had been keeping aquatic plants emersed in a variety of glass and plastic containers on my desk and kitchen counter with under-cabinet lighting for some time, but I decided I wanted something more permanent and versatile. Really, the only place in my house where I have room for such a set-up is in the basement, which is pretty cold year round. In the summer the temperature runs around 65°F and in the winter it drops to about 50°F. So I would need to heat the system in some way, and obviously I would need to provide artificial light as well. I bought two little indoor greenhouses from Amazon, but I have found that closed plastic containers work great for keeping humidity in, so the plastic covering for the green houses isn't necessary other than maybe holding a tiny bit of heat in. Wire storage racks that were SLIGHTLY longer would allow two file boxes side-by side which would be more convenient. I definitely needed heat, and the most economical way I could find to do it was to use seedling heat mats on a thermostatic controller. I use one controller for a set of 4 mats, one on each shelf. I am slowly switching over to using as many translucent file boxes as will fit on my shelves, with 2" seed pots. I can fit 12 pots per box this way. The boxes keep plenty of moisture in... it actually rains inside them. The translucent plastic seems to let enough light through for everything I'm growing, but some people further modify these boxes by cutting a window in the top of each and siliconing in a plexi sheet to allow even more light through. I have also used a mixture of smaller boxes, but the boxes make it harder to keep plants separated and properly labeled, and don't have enough head-room for many of my plants. I use a number of smaller containers as "holding space" for plants that I just don't currently have room for in my tanks. Who wants to throw out pretty Anubias! For these plants I put a layer of calcined clay over the soil based substrate to more closely mimic their conditions in nature. This is also a great way to save Anubias that has become infested with algae. The new emersed leaves will, of course be completely algae free, and you can just clip off any ugly leaves! I've been really happy with these set-ups. All the plants are growing well, and many have been flowering. For planting media, I have been very happy with Fluval Stratum for the most part. I have a few containers where I used some left-over Tropica substrate and that seems to work about equally well. I line the pots with a piece of filter floss before putting substrate in, to keep it from leaking out the holes in the bottom of the pot. The pots then stand in an inch or two of water. These are aquatic plants, so none of them mind wet roots! Many Cryptocoryne growers use different substrates than I have, but so far, all my Crypts, from black water species to limestone species seem to be quite happy with the Fluval substrate. All the more typical aquarium species of course, do fine in it too. When first transitioning plants from the aquarium to the grow-out racks, I mist them daily, but they soon adapt to the humid emersed conditions in the boxes. I fertilize as needed with organic Bonsai fertilizer that I also use for my Bonsais. It is quite mild, and most of these plants don't require heavy fertilization. Interested in Learning About TRUE Dutch Aquariums? This shows what a clean look you get with these covers. They really don’t detract much at all from the rimless “look”. I have a number of small, rimless tanks, and I love the look. But I got very tired of the amount of water that evaporated out of them. It also limits the fish you can keep, because jumpers… jump. Bailin Shaw (Aquatic Gardeners Association and Chicago Aquatic Plant Society) shared this this simple, elegant solution with me. I’ve covered all my nanos this way since! Have a piece of glass cut so that it fits RIGHT to the OUTSIDE edges of the tank. (measure carefully) Make it enough shorter than the tank measurements that your filter and cords will fit behind it. Then use either sand paper or a sanding sponge (I found the later easier to use on glass edges) to file down the sharp edges of the glass. Take your time and do a thorough job, including the corners. If you don't, DON'T complain to me that you've cut yourself on it! A view of the top of one of the tanks, showing the silicone furniture bumpers in the corners. Then stick a silicone furniture bumper on each corner, in from the edge JUST far enough that the bumpers sit inside the tanks walls. Here's a link to the ones I ordered on Amazon, but I'm sure you can get them locally too. I prefer the square ones because they really hold the cover securely, but you can use round ones if that's all you can find. I find that the little space in the back is large enough to feed my fish without lifting the cover, but it isn't big enough to allow a lot of evaporation, and no one has found their way out. With any glass cover on a planted tank, it is imperative to keep it really clean, or you will reduce the light getting to your plants. Use a damp paper towel to wipe dust off a couple of times a week, and when you do your weekly water change, rinse and wipe down the whole cover. If you start to get any lime build-up, wipe it down with white vinegar. If it's bad, they are cheap to make, so just replace it! 'Since I originally wrote this, I found nice little clear glass handles on Amazon. These give a nice, clean look to the tank while also making it easier to lift up for feeding and maintenance.